At left, Will Eward and Cindy Eward demonstrate an orthopedic exam with their dog Virgil. Will Eward treats both dogs and people with cancer. Eward is on the steering committee of The Consortium for Comparative Canine Oncology (C3O), which will formally bring together cancer doctors and researchers at Duke Cancer Institute and the NC State College of Veterinary Medicine and will fund research projects that include both. "When it comes to cancer, it really doesn't matter if you have fur or skin or feathers. It's the same disease," Will Eward says. 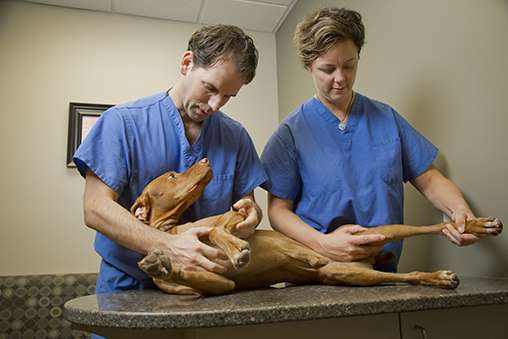 Will Eward, DVM, MD, works to find better treatments for a cancer called sarcoma. It makes no difference to him that half of his patients walk on four legs and bark at the doorbell. Eward, an assistant professor of orthopaedics, spends the first part of his week treating dogs at Triangle Veterinary Referral Hospital, and the second half treating people at Duke Cancer Center. "When it comes to cancer, it really doesn't matter if you have fur or skin or feathers," he says. "It's the same disease." Sarcoma is rare in humans, but when it strikes, it's often lethal. It's much more common in dogs. In his early days as a full-time small animal veterinarian, Eward saw so many dogs with sarcoma, he became frustrated with the lack of good treatments. So he went to medical school to launch a full-scale fight against the disease in both species. A few other cancer specialists, including Duke's Mark Dewhirst, DVM , Ph D, Gustavo S. Montana Professor of Radiation Oncology, have believed in this idea, called "Comparative Oncology" or "One Medicine," for more than 40 years. Increasingly, scientists are taking notice. The approach is behind a new formal partnership between Duke Cancer Institute and the College of Veterinary Medicine at North Carolina State University. The Consortium for Comparative Canine Oncology (C3O) will formally bring together cancer doctors and researchers at the two institutions and will fund research projects that include both. Dewhirst and Eward are members of the C3O steering committee at Duke, as is Neil Spector, MD, Sandra K. Coates Associate Professor of Medicine. Many new cancer medications are first tested in research animals, such as mice that are bred to get cancer. But studying that same drug in a pet dog who developed cancer naturally is much closer to studying it in a human. "Because of a dog's size, you can do dosing that's more like dosing in a human," Dewhirst says. And, dogs get cancer as they age just like we do, so pets in clinical trials may have other illnesses, like diabetes or heart conditions, making the results more realistic, he adds. In addition, the idea of "dog years" is true for cancers, too, Eward says. For instance, he may find out the ultimate outcome for a dog with sarcoma in two years; in a person it could take ten. So trials in pet dogs may reveal how well new therapies prolong survival faster than human trials. 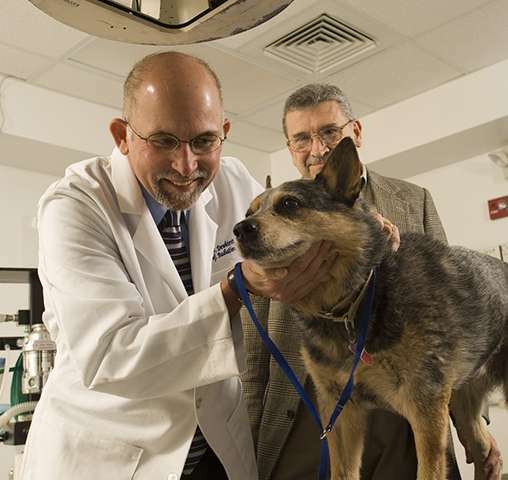 Radiation oncologist Mark Dewhirst and NC State veterinarian Donald Thrall with a pet dog who participated in one of their many clinical trials of new cancer therapies. Dewhirst co-developed a technology to better target chemotherapy. He and Thrall tested it in clinical trials in dogs before it was tested in humans. Called Thermodox, the product is now being tested in late-stage clinical trials in people with liver cancer. Duke has a long track record in comparative oncology, thanks to Dewhirst. A veterinary radiation oncologist, he came to Duke in part because of its proximity to potential collaborators at NC State's veterinary school. He and colleagues there conducted clinical trials of new therapies in pet dogs starting in the 1980s, yielding valuable information about dosing and possible complications. That was the case with a technology that Dewhirst and Duke biomedical engineer David Needham, PhD, developed to target a potent chemotherapy directly to tumors. Patients receive a drug encased in liposomes (bubbles made out of fat) that dissolve only when heated. Then heat is applied to the tumor only, and the liposomes release high doses of the drug exactly where it's needed. The technology worked in mice, and in 1999, a company called Celsion bought the rights to it. They agreed for Dewhirst and Donald Thrall, DVM, an NC State veterinarian, to test it in trials with pet dogs. "One of the very first dog patients we ever treated had an anaphylactic reaction," Dewhirst says. "The dog's face swelled up after we gave the drug. We realized that they're going to have to be pretreated with steroids and antihistamines." The researchers were able to quickly treat the reaction in that first dog. "He did okay," Dewhirst says. "And that regimen that we developed in the dogs ended up being what's used in humans to prevent that kind of reaction." The technology, called Thermodox, is being tested in late-stage clinical trials in people with liver cancer. More recently, Eward moved a new imaging technique for sarcomas into a human clinical trial because he showed that it worked well in pet dogs with the disease. Surgery can cure sarcoma, but only if the surgeon removes all of it. "It can be really hard to tell where the last cancer cell is," Eward says. "If there are any cancer cells that are still out there in the body, they'll grow a new tumor. Sarcomas do this to a greater extent than the more common cancers." So he and colleagues Brian Brigman, MD, PhD, and David Kirsch, MD, PhD, teamed with scientists at MIT to develop a technology to reveal every last sarcoma cell. The patient gets an IV of tiny fluorescent probes that glow when they come into contact with certain enzymes that are present in soft tissue sarcoma. When the glow is gone, so is the cancer. The technique worked well in mice. But when the researchers applied to the U.S. Food and Drug Administration (FDA) to test the device in humans, they were told they needed to do years of additional testing in laboratory animals first. Eward, who owns four dogs himself, decided to go another way. "The idea that we would ignore pet dogs with cancer and try things on healthy laboratory dogs is just a wrong-minded approach," he says. So Eward and colleagues, including his wife, Cindy Eward, DVM, organized a trial to test the imaging device in pet dogs who were having sarcoma surgery. The trial took place at their veterinary practice and at Tufts University. "It worked great in these dogs," Eward says. When the imaging technique showed that all the tumor was gone, the pathology test after surgery confirmed it. And it was safe; the dogs with sarcoma had no adverse effects from it. 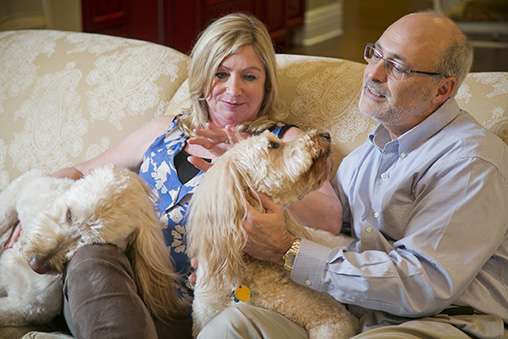 Kathy and Michael Kastan at home with their goldendoodles, Micah and Maggie. In 2015, Kastan chaired the planning committee for a national panel on comparative oncology, sponsored by the National Academy of Medicine. "Because of this trial in pet dogs, the FDA gave us the green light to go ahead with a phase 1 human clinical trial," Eward says. That trial, which tested the safety of the technique, is complete. The team plans to enroll human patients in a phase 2 trial in early 2016. Moving forward, researchers are excited about the possibility of applying newer targeted therapies in dog trials. Pet owners are likely to be especially interested in these therapies, which are less toxic than traditional treatments, says Kastan. And the pets could help scientists find biomarkers that measure when a targeted therapy is hitting its mark. Will and Cindy Eward with their dog Pete. 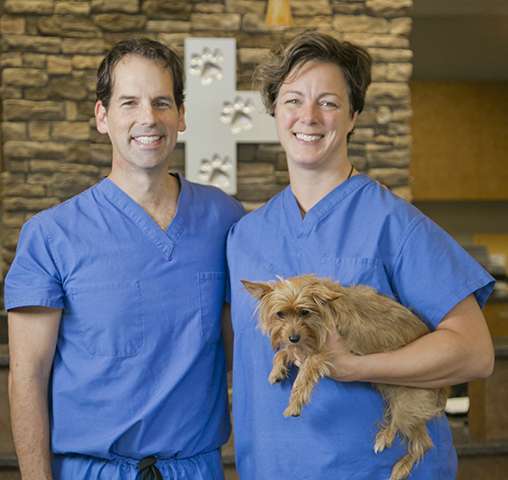 The Ewards ran a clinical trial in pet dogs to test a new way of detecting and removing sarcoma during surgery. The technology is now in human clinical trials. In addition, pet dogs may help reveal previously unknown cancer-causing genes. Eward believes that the most important genetic mutations will likely be those that are found in both dogs and humans. "If you look at a sarcoma, you will have thousands of mutations. You're overwhelmed with information," he says. "But if we find that a certain type of sarcoma in a dog and the same type of sarcoma in a human have only four mutations that are common between them, those are probably the driver mutations." Kastan agrees that sequencing and analyzing the genetic mutations of cancers in dogs is a priority. He especially sees value in doing that with certain breeds, such as golden retrievers, that are more likely to get certain types of cancer. "Many of the genes that we know about that cause cancer in humans, like the BRCA genes in breast cancer, were discovered by studying families that have a high predisposition to cancer. When a particular dog breed gets a high rate of a particular cancer, it means there's something about their genetic makeup that's predisposing them," Kastan says. "So studying them is like studying a family." Pet owners—81 percent of whom consider their pets as family members—would likely agree.